My husband Bill, who wakes up earlier than I do, took this picture of the beautiful dawn sky for me. A lovely gift first thing in the morning! Today I am readying some fabric and paper artwork for a display at the Holiday Stroll in my town, which will be taking place this Saturday. I have a large storefront window to use for my work, and I think I am going to pin the pieces on a pretty drapery that will hang in the window. My job now is to put borders on these pieces and add details where I feel they need them. I could offer some for sale if I want to, but suddenly they feel like my children!! Is that strange? I have sold artwork before, but unexpectedly have reservations about "letting go"! Hmmm.... Any thoughts from readers about this feeling? This is the last day of Art Every Day Month. It has been a pleasure to participate in it. I've met and received comments from some extremely talented artists as a result of it, and I want to thank Leah Piken Kolidas of Creative Every Day for organizing and facilitating this adventure. I've really loved it!! I had an empty lipstick tube and got the idea of a little kitty tucked inside who would twirl up and pop out when the tube is twisted! I totally removed the lipstick, and cleaned out the tube, inside and out with alcohol. I then made a skinny cat body out of rolled up and glued felt, measuring first to make sure it would fit inside the tube when twisted down, and cut ear shapes on top. "Rhinestone"eyes were glued on with jewelry glue and a little nose embroidered. Finally, a tiny seed bead necklace was securely stitched on. I used hot glue to secure the bottom of the cat body inside the tube, and added some stick-on ribbon to the outside. Making this little whimsy was so fun, and the recipient got a big kick out of it!! As I reflect upon all the many things I am thankful for, I must include the wonderful friends and lovely people I have come to know through my blog. The world seems so much warmer as I communicate with artists and crafters and lovers of beauty and nature from all over the world. My self confidence as an artist has become so much stronger due to the positive, supportive comments of people whom I have never met, but who have taken a moment to respond to my thoughts and artwork with a kind word. So, as we celebrate the feast of Thanksgiving here in America, I'm sending out my thanks to everyone who stops by to read this, and to wish you a blessed "thanksgiving" of your own! AED Day 21 - Cats, Cats, Cats! I walked into my living room today, where my husband was relaxing with a sandwich and the newspaper. Guess who was sitting at full attention, waiting for a morsel to fall unnoticed, to be gobbled up in an instant! I haven't produced any new artwork lately, but I have been involved in the world of art in a different way. A newly formed arts council in my town is planning a Holiday Stroll in December. I'm part of a group which is scoping out shop windows in the downtown area where local artists can display their work during the stroll. I'm excited that I will be able to have a space for my own work - a great opportunity to be in contact, as an artist, with people in my own community! I thought it would be fun to use this post to share a few cats from my collection of 'little cats'. I have purchased some when traveling, and some have been given to me by my husband and daughter. The one on the left was brought home to me just last night by my husband who returned from a business trip to Thailand. On the upper right is a jade cat which he had brought from Hong Kong and on the upper left is a cat from the Czech Republic. My daughter Kate brought the black painted cat on the left in the middle row from Mexico, and the one on the right in the same row from New York City. Others have been purchased in Quebec, Maine, New York and Massachusetts. They live in different spots in my house, but after this 'photo shoot' I think I'll give them new locations. All the better to enjoy my little guys with a fresh point of view! I feel like I'm going through a bit of a creative dry spell, so I'm posting a picture of a Fall-ish bouquet which I made some time ago. It is fused fabric and cut from some decorator scraps I had lying around. Today was a lovely day here - nice and sunny and a bit chilly. Seems like the trees have lost most of their leaves, and that is a bit sad, but I actually like this transition to winter. I love the lacy effect of the bare branches of trees crisscrossing each other against a muted sky. I feel like nature is resting, pausing to replenish itself before its resurgence in Spring. Winter can be dreary and bleak, but snow is so visually beautiful and inspiring, I look forward to it. Of course it can be inconvenient, but I'd rather deal with some snow than have no change of seasons at all! For me, each season has its own special beauty. It is Day 15 of the Art Every Day Month challenge, and this is what I'm working on today. It is a fabric portrait of a young woman and I'm still in the process of designing it even as I begin sewing. That is how I usually work - with a rough, unfinished sketch which develops as I go along in the project. It poured rain here most of the day yesterday, but there are signs of clearing today. I'm looking out my porch window at more leaves that need to be raked, but today is a day for inside work, reading the Sunday paper and sewing. Hope everyone who reads this is having a great day! 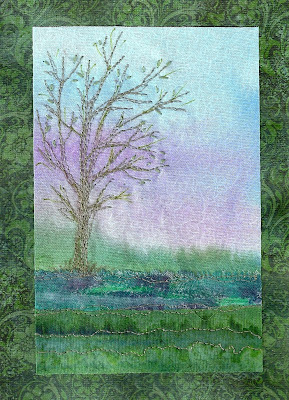 Here is my bit of fabric art for the day - a simple landscape made from scraps of hand painted fabric and a bit of machine stitching, mounted on some pretty scrapbooking card stock. I may add some stitching around the edge but this is it for now! Although it is done in cut paper, I'm posting it here for AED and will also put it on my other blog, Paper Perks. Hope everyone who is participating in Art Every Day Month is enjoying it as much as I am. 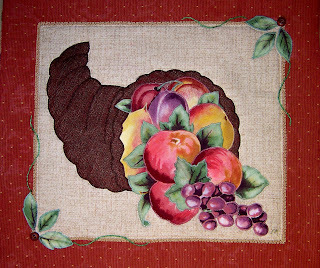 This wall hanging was buried in my "unfinished works"drawer until I pulled it out last week. I couldn't seem to get the colors right in this photo, but it has a lot of lavender-to-fuschia coloring and many shades of green. The entire piece is fused in place, so now I have to decide how I will finish off all the raw edges. Satin stitch? Straight stitch? Hand embroidery? And I do want to add beading to this one, as well as other embellishments. I want the finished result to sparkle! Kristy has found a sunny spot. A hand pieced quilt is in process. The back porch still has colorful views. The Christmas cactus is blooming beautifully. Quiet moments on a Sunday. AED Day 6 - Apple Picking! 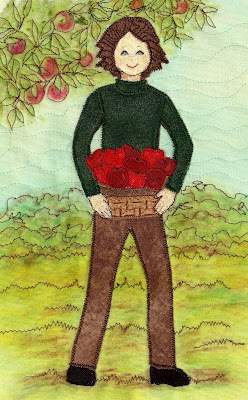 Today, on day 6 of the Art Every Day challenge, I finished up this little lady carrying fresh picked apples from the orchard! I'm thinking she looks like a Mary Jane - what do you think? She is cut from commercial fabrics fused onto muslin and appliqued with a machine satin stitch. The muslin background was then painted with fabric paints and the details sketched in with a machine straight stitch. I then went back and added a bit more shading with colored pencils. I also wanted to show some beautiful handmade gifts (the best kind, I think) given to me as a belated birthday gift by my friend Karen. The pillow is filled with lavender and smells heavenly! The towel to the right is neatly trimmed with lovely birch tree fabric. And the pretty bag in front is filled with balsam needles from the trees on Karen's property in Vermont! Am I a fortunate lady or what!! Today, instead of making art, I appreciated art! I went to A Quilter's Gathering, a quilt show in Nashua, NH with friends Andrea, Pam and SooKhim. In addition to looking at all the beautiful quilts, we hit the vendors mall and I couldn't resist picking up a few pieces of fabric, some beads and an embroidery kit! I also want to show some atcs exchanged at the recent craft days I shared with Elaine and Karen. These are the cards Karen made for Elaine and me (click to enlarge). She used cotton and silk fabrics, ribbon trim and beading. Such rich colors! Elaine made a whole batch of atcs, which Karen and I took turns choosing. All are made from cut paper, with Elaine's special touch! Below are more of Elaine's paper cuttings. So, even though I didn't get to make art today, I feel like I soaked up some arty vibes from other people! I'm hoping that tomorrow will be a productive day! Start with a square piece of scrapbook paper. Mine was printed on both sides, but it can be white on the back, and I made it 5"x5". On the back of the paper, draw 2 pencil lines from corner to corner, which will cross at the center. Fold each corner of the square into the center and go over the fold with your fingernail or a bone folder to make it crisp. When opened up it looks like this. Fold the corners back into the center. Now fold the opposite straight edges into the center, unfold them and fold the other opposite edges into the center. Opened out it should look like this. Make 2 cuts on 2 opposite sides - a total of 4 cuts. They go from the outside edge to the first fold, as seen in the photo above. Fold up those sides and fold the corners in. Now fold the short sides up over the first set of sides, down the inside wall and ending up with the points meeting on the floor of the box interior. You can glue these points down or even make a contrasting square to cover the floor and glue that down. Here are some little boxes with covers, made by Elaine. The covers are slightly larger, starting out with a square 1/4" larger than the square for the box bottom. I hope this tutorial is clear. The boxes are really cute and light, and, with the variety of papers out there in the craft stores, the possibilities are endless. Tomorrow I'll post more about our crafty get-together! Today I am meeting with two dear friends - Elaine and Karen, mother and daughter, and we are having an artsy craftsy two days together! You may know Karen from her blog, Sew and Sow Life. Here are my ATCs which I brought - a tree for each, and the left card for Karen, the right for Elaine! We are having a great time - more to show tomorrow!! I can see that the Art Every Day challenge is going to get me to finish some long neglected pieces and create some new work, too! Kristy's little head, cut from fabric and highlighted with acrylic paints, has been floating around my studio for a while! Today I made paws, but now she needs a body and a background. My original intention was for her to be peeking out from under a blanket, so I'll go with that. I need to cut out the missing elements from fabric, fuse and stitch the whole piece, and highlight it with some paints or colored pencil!! I will get it done this month! Yay! 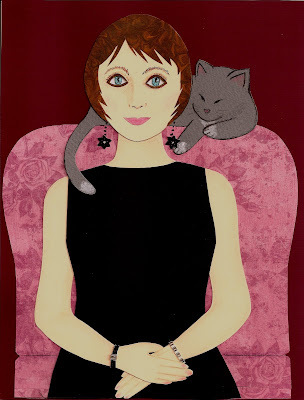 I've decided to participate in the Art Every Day challenge for November, hosted by Leah at Creative Every Day. I ask myself, "Am I nuts? This is a busy month for me!" But I know for a fact that a challenge like this excites me and gets me moving. I love the idea of doing this in concert with other artists, checking in on how they are doing and offering encouragement. The parameters are pretty loose - it isn't necessary to produce new art every day - it can be art-in-progress or even just art-related, and it doesn't have to be every day. But I'm going to do my best to keep up and I'm hoping that the momentum will continue on into December and onward after that. My first piece is simple, reflecting one of my favorite things about Autumn - the sight of yellow trees glowing the day after a rain, their trunks nearly black with moisture, contrasting with the deep golden leaves sparkling in the sunlight. I hand painted fabric for the yellow leaves last night, sprinkling the paint with coarse salt to disperse the color. All of the fabrics are fused in place with Wonder Under. I'm planning to add stitching, but that will be done another day!